Jeff Bezos was born in 1964 in Albuquerque, New Mexico, as Jeffrey Preston Jorgensen, to parents Jacklyn Gise and Ted Jorgensen. His parents’ marriage lasted for less than a year. When Bezos was four, his mother married Miguel Bezos, an immigrant from Cuba, who later would legally adopt Jeff. From an early age, Bezos demonstrated an aptitude for engineering and electronics. At the age of four he managed to dismantle his cot with a screwdriver and, not long after, set-up an electric alarm system in his bedroom in order to prevent his younger siblings from entering. Following his graduation from Princeton, Bezos moved to New York, working at Fitel, Bankers Trust and, in 1990, he became the youngest Senior Vice President at investment firm DE Shaw. However, this was not enough for Bezos. Having read about the phenomenal 2,300 percent growth in web commerce, he drew up a list of the best things to sell over the internet. His list consisted of CDs, computer hardware, computer software, videos and books. He chose books. Having made this decision, he flew to Los Angeles to attend the American Booksellers’ Convention, in order to learn about the book-selling business. What he discovered was that the majority of the big book wholesalers had already compiled electronic lists of their inventories. Seeing this, Bezos identified a niche in the nascent E-commerce market, whereby book buyers and sellers could trade with one another. Armed with this knowledge, he relocated to Seattle in 1994 to begin the company that would later be known as Amazon. Having moved to Seattle, Bezos founded Cadabra, an online book-selling portal. However, the name didn’t stick for long, as it was confused verbally by many with the word ‘cadaver’. The name Amazon was conjured principally because it began with the letter A, which would be near the top of any list, especially, as it turned out, on a search engine. The Amazon website was launched in July 1995. The origins of Amazon are less than glamorous. Bezos founded the business in a two-bedroom house, with extension cords running to the garage where the main hub of the operation was located, consisting of three Sun Microstations. It was in a run-down, industrial part of Seattle. The company had just over 1,000ft² of office space and a warehouse of 400ft² in the basement. Regardless of this, Bezos’ plan soon came good. Three days after launch, he received an email from Jerry Yang, one of the founders of Yahoo, asking if Bezos was ok with him placing Amazon on Yahoo’s ‘What’s Cool’ page. Yahoo put the site on the list and orders rocketed. By the end of the week, Amazon had taken over $12,000 in orders, and the following week brought in nearly $15,000 worth of orders. Bezos has always had a clear focus on customer relations as one of the cornerstones of the Amazon business. In one notable instance, an elderly woman sent an email to the company saying that she loved ordering books from the site but had to wait for her nephew to come over and open the packaging for her as it was too difficult for her to open herself. In response to this, Bezos ensured that the packaging was redesigned to make it easier to open. However, during the formative years of Amazon, his dedication to customer services meant that Bezos also became known as a CEO to be feared. For example, when the customer services staff fell a week and a half behind in answering emails – in spite of having just worked a 12-hour, seven-day week – Bezos called the manager to complain. When she told him they couldn’t work any harder, he came up with a solution – to dedicate one weekend to competing with each other to see who could get through the most unanswered emails, with a cash bonus of $200 for every thousand messages he or she could answer. In terms of his management ethos for how a company should be run, Bezos has stated that he wants a decentralised – even disorganised – company, where independent ideas would prevail over groupthink. To this end, he has instituted what has become known as a ‘two pizza’ team when it comes to management meetings; that is, any team should be small enough that it can be fed with two pizzas. Essentially, the more people there are, the less productive the meeting will be. Continuing with its exponential growth in revenues, Amazon floated on the NASDAQ in 1997. At the same time, Bezos continued to diversify Amazon’s offerings with the sale of CDs and videos in 1998, and later clothes, electronic items and toys, as well as founding new partnerships with major retailers. While many dot.com companies of the early 1990s went under, Amazon grew in stature, with yearly sales rising from $510,000 in 1995 to over $17bn in 2011. Returning to its roots as a book-sales merchant, in 2007, Amazon released the Kindle – a handheld digital book reader that allows users to buy, download, read and store their book selections. Bezos then moved Amazon into the tablet marketplace, releasing the Kindle Fire in 2011, a product that was closely followed by the Kindle Fire HD, designed to rival Apple’s iPad. With the introduction of the Kindle, Amazon managed to take a 95 percent market share in the US in terms of e-books. When, in 2010, Apple introduced its iPad tablet device, which was also designed for use as an electronic reading device, Bezos responded aggressively, slashing the retail price of the Kindle as well as incorporating new features. As testament to his unique brand of innovation, in 2012 Amazon’s share price increased by 30 percent – the equivalent of a tenfold increase over the previous six years. It is no surprise that Bezos was named Businessperson of the Year in 2012 by Fortune. 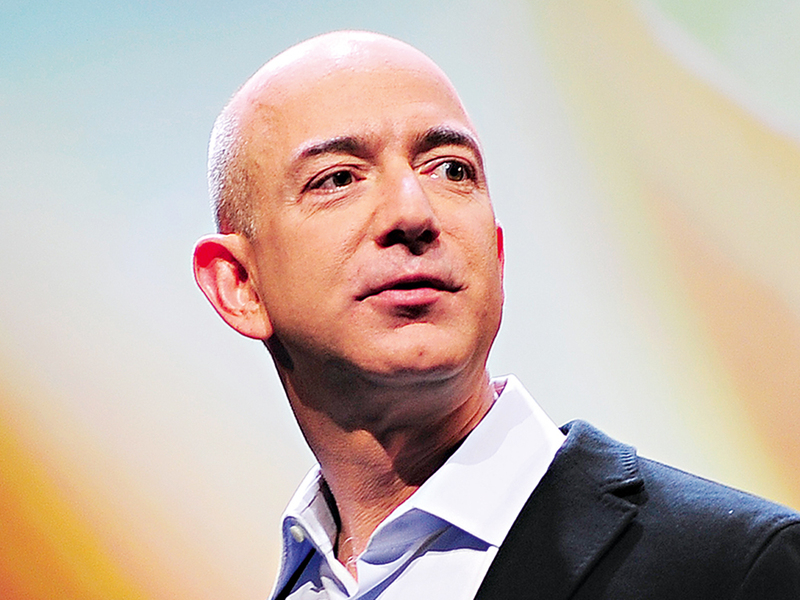 From humble origins to CEO of an S&P 500 company, Bezos has stuck to his principles. He could have gained a small fortune as a Wall Street broker, but instead followed his heart and became a true pioneer of modern business.